Watch video clips of animals at London and Whipsnade Zoos in the UK. See a video clip of zoo babies in the US. Lots of photos and fun facts about zoo animals. 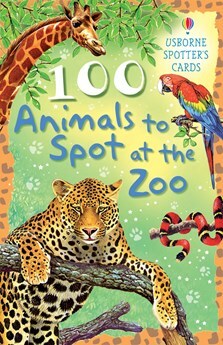 A pack of pocket-sized cards to help identify 100 animals to be found at the local zoo or wildlife park. On each side of each card, there is a detailed picture of an animal, with information, facts and statistics. With internet links to fun websites with photo galleries, games and more information. This set of 100 cards puts a whole menagerie of wildlife right at your fingertips. Each of the animals has its own detailed illustration, as well as facts and statistics, such as size and habitat. Pocket sized and portable, the cards are an ideal companion for a school trip to the zoo. I purchased these cards for my three year old son at the London Zoo. He loves them and so do I. He loves having me read each card and he enjoys grouping his favourites together. The cards are very informative. So much so, that I do not get bored reading them to him over and over again!! A great purchase.